Supporters of the president Paul Kagame  of Rwanda  have turned to the power of Facebook, Twitter and blogs to help him win presidential election that will be held on 9 August 2010. As a career statesman with a rich profile and long list of accomplishments, President Paul Kagame has a large following of admirers who look up to look up to him for guidance as Hero. This is their platform. The Fan Club is managed entirely by the president’s fans as a group with a common cause, purpose and direction. As a fan of President Kagame, this August campaign is about you. Your voice counts. This is your platform to share thoughts and advise on issues to address during and after the presidential elections. Stand up for what you believe in, make Rwanda proud! Connecting with other supporters through Fan Club blogs. Spreading the word about the Fan Club and our Hero’s agenda for Rwanda especially during the upcoming Presidential campaign. Boosting morale of people who share our values and love Rwanda. Rwanda has positioned itself as a regional hub for information and communication technology (ICT) with a robust ICT industry, including e-commerce, e-services, applications development, and automation. It is believed that ICT will be harnessed to generate wealth and be a key economic driver. As part of its policy goal to progressively transform Rwanda from a predominantly agriculture economy to a predominantly information-rich, knowledge-based economy (PIKE), the Government committed itself to the implementation of the envisaged four rolling NICI/ICT4D Plans over the 20 year life-span of Vision 2020 and the ICT4D Policy. 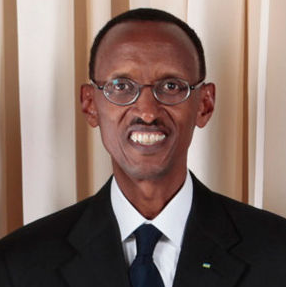 As highly expected by the fans, President Paul Kagame was among the four candidates cleared yesterday by the The National Electoral Commission to contest in the August 09 poll. NEC has accepted Kagame’s application for the race after the RPF returned as its flag bearer to run for the second and final term as provided for by in the constitution. May God be with you in leading Rwandans to their social welfare. Keep it up! Yes our beloved PRESIDENt is gonna win 2010 ELECTION.no one like him. There are two other Facebook pages for Kagame; PaulKagame  with 6,327 followers and Paul Kagame with 8,169 followers (at the time of writing this post). today co-chaired the meeting of the Broadband Commission for Digital Development held in Geneva, Switzerland. Mukiza I have this feeling that the anonymous admin for this page may have silently met his or her creator without our knowledge. For what explains the fact that this page has gone non-updated since august of 2009. That is a hell of a long time for a live person to be that un-responsive. If my worries are founded,then my sincere condolences are guaranteed. I recently moved cities and have been largely without the internet for the past 3 months as well as splitting up with my partner of over a year. I'm sorry for neglecting you, but I still check in whenever I can. Unfortunately even admins are human. If anyone has any complaints all they have to do is make a topic and I'll see it. As for the page, well it seems to take care of itself pretty much, or so it seems to me. But I'll do some spring cleaning. Kagame supporters are also on the popular microblogging site, Twitter. There is paulkagame , which is private (196 followers) and PaulKagame with 964 followers. We will have to wait and see the overall impact of social media in the 2010 presidential election in Rwanda.